We hosted a FANTASTIC 4 ALARM FIREMAN party at the COOP this past weekend. It falls into our new category of "the whole COOP and Caboodle" party! Meaning that we were in charge of just about everything on this one! Adult food, cupcakes, fruit, flowers... just about every extra you would need for a fantastic celebration! We also had a train out in the front courtyard, and a REAL firetruck taking the kids for rides around the neighborhood! The fireman also brought some water play -- which was GREAT considering it was the hottest afternoon we have had this year! Despite the heat -- the party was a huge success. Julie from Blue Cupcake -- who NEVER disappoints -- did an amazing cake and cupcake display for the table centerpiece, which was flanked by some gorgeous flowers -- red, yellow and white -- I did just for the occasion. 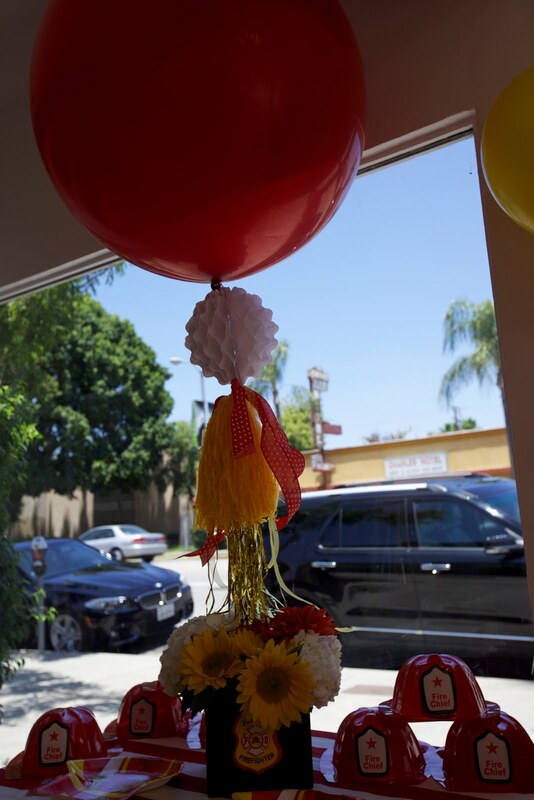 We did FOUR of our big Birthday balloons -- 2 red inside -- 2 brilliant white outside... which I think really adds so much to the look of the party. 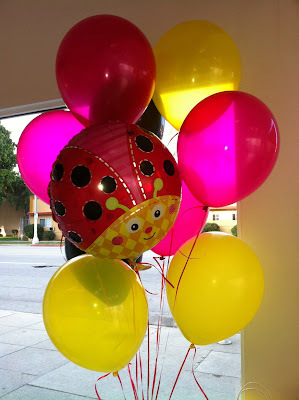 There is something so modern and chic about fewer - but waaaaaaay larger balloons, in my humble opinion. I think they looked gorgeous. All the kiddos go their very own fireman hat (these were a hit for the ride on the truck!) 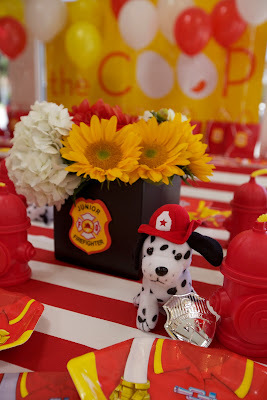 and a bag with a stuffed Dalmatian dog, a fireman badge and a super cute fire hydrant sippy cup. 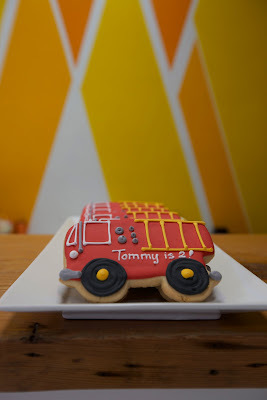 Mom also brought these really gorgeous firetruck cookies that were put in the goodie bags AND offered up during the party. 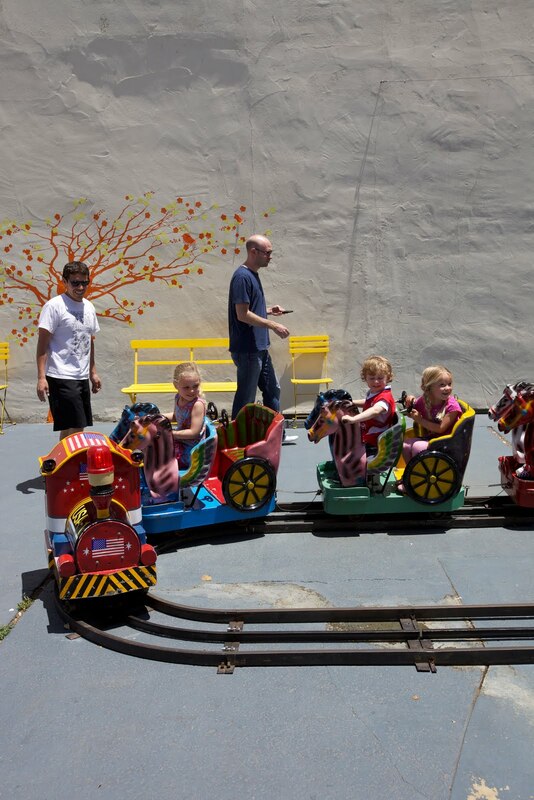 It was a blazing day... super hot and super fun for all! Guess which party this birthday boy used as his inspiration! 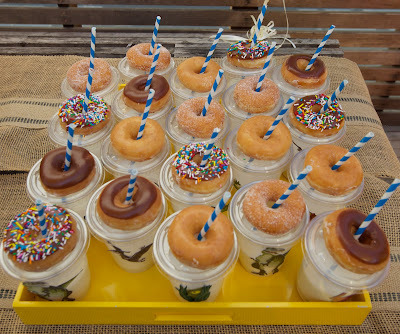 Yep -- he was a guest at sweet Gracie's Dolphin, Donut, Disco party last year! 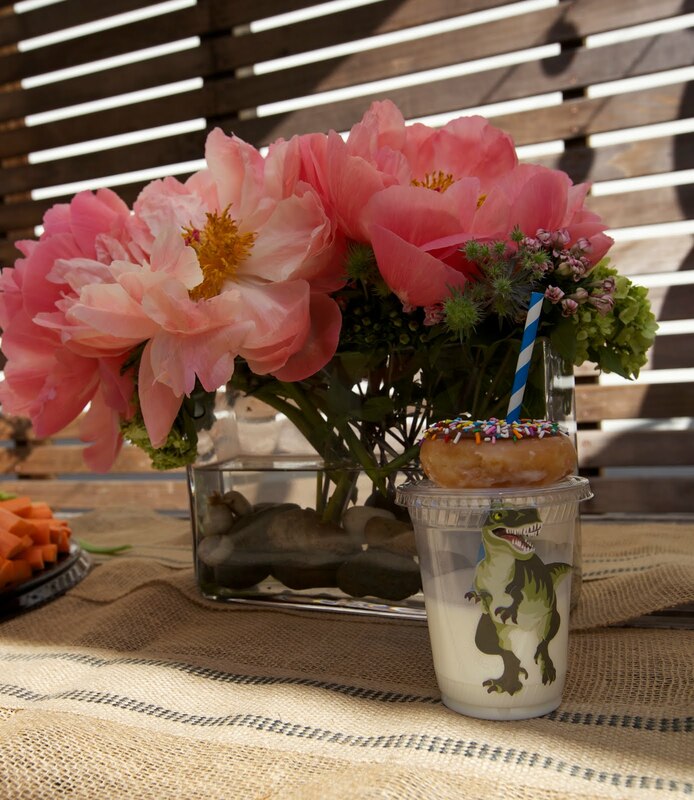 His mom and I suspect that he really wanted a Dinosaur party -- but also REEEAAAAAALY wanted the donuts looped on straws in milk from Grace's party. So we gave it to him! 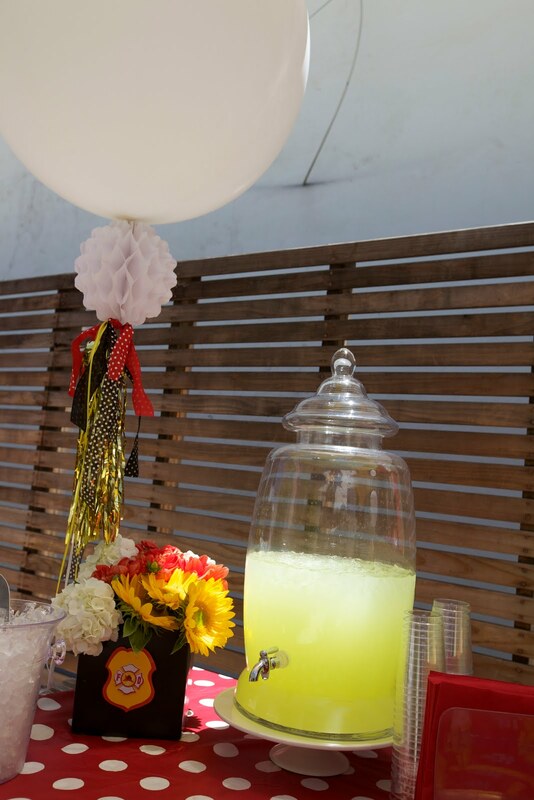 The party was light on the disco element -- I just added disco balls in the very cool raised succulent centerpiece I made for the event. (I love how it looks like the dino's are grazing at a trough!) And of course there is always our big disco ball in the playspace! I added some more blue and green elements than we usually use (the tablecloths on the back table) and I think it turned out nicely. 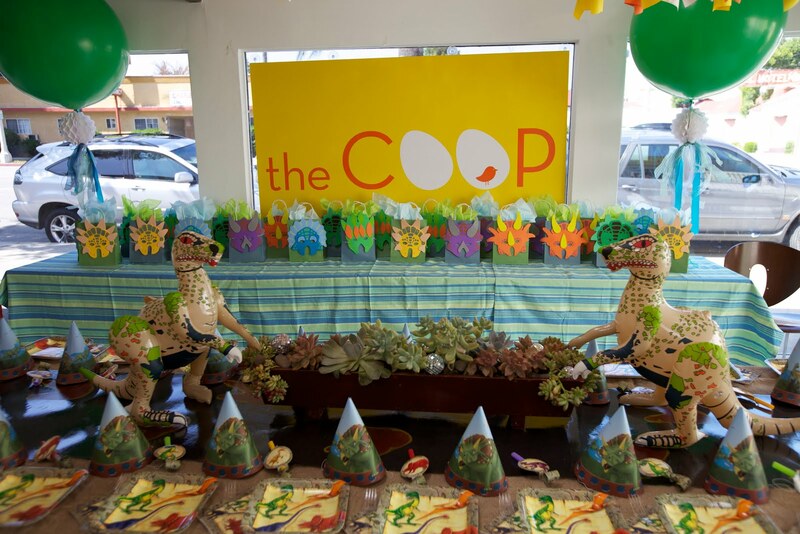 Two BIG birthday balloons -- which are quite popular party additions here at the COOP -- and the rows of goodie bags with the masks wrapped around them really drove the Dino theme home in the front room. 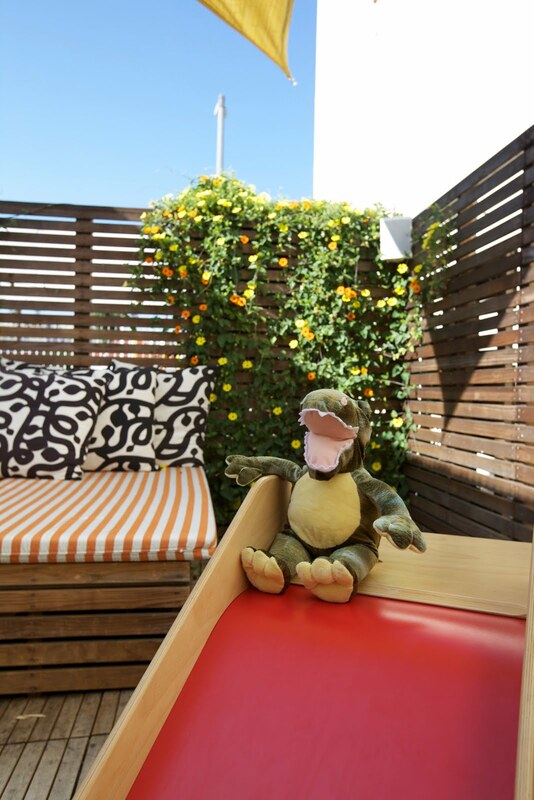 I also hung 3 D Dinos from the ceiling around our fab COOP sculpture, and added a GREAT party addition with stuff your own dinosaurs (a la Build a bear - but more affordable! 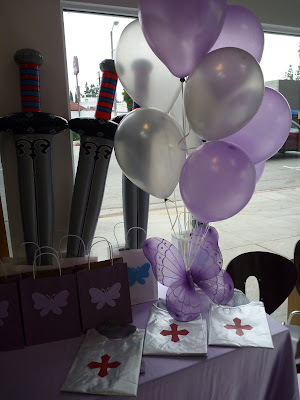 http://www.mobileteddybearparties.com) The kids loved them! Another big hit was -- of course and as expected -- the dino cups of milk with vintage striped straws and a Krispy Kreme Donut looped on it! BIG hit! NO surprise there. I think this party looked beautiful -- a modern cool dino party suitable for all ages! This party was so darling looking -- I just had to post. It wasn't really OUR theme -- the mom brought the goodies.... but we DID do the flowers and balloons and let her use our fab red and white striped runners (which were PERFECT!). I just LOVED the combo of the red and white and TURQUOISE. Great color scheme. Bold, Bright... and gender neutral. Just how we like it here at the COOP! 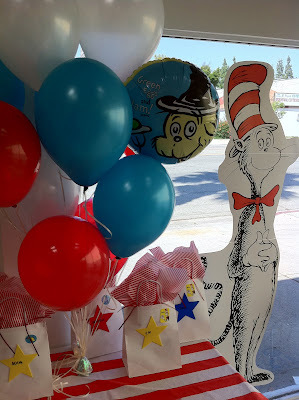 I also loved the Stars on the bags (and the striped paper inside)-- reminded of those silly Star Bellied Sneetches. Just a great looking graphic party that I thought was worth sharing! Hope you enjoy! I really believe that the COOP is a truly magical location for an adult party and this weekend we put together something really special for a beautiful lady celebrating her 35th birthday. 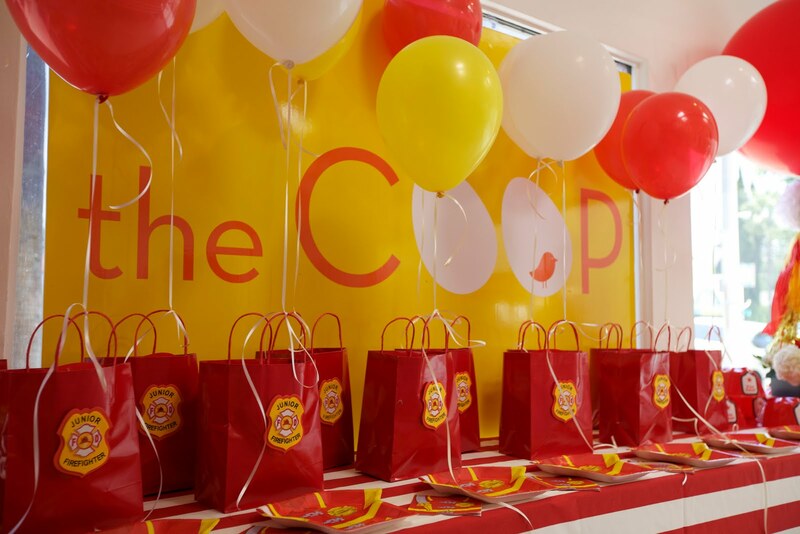 Amy had recently had a Barbie themed birthday for her daughter at the COOP and loved it so much she decided to have her party with us too. Amy chose the color scheme of orange, hot pink and gold and we went from there. I really wanted it to be romantic and sultry with elements of sweetness. 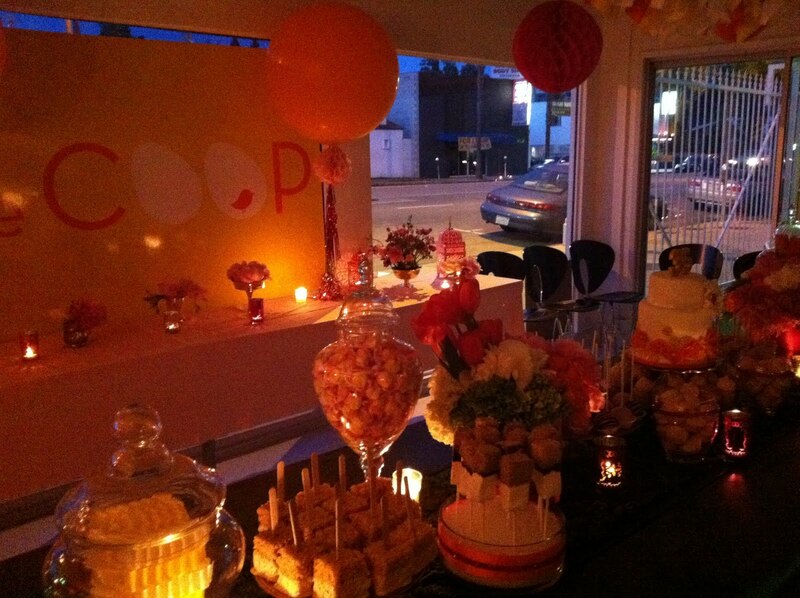 Julie from blue cupcakes supplied the dessert table which was gorgeous as usual. 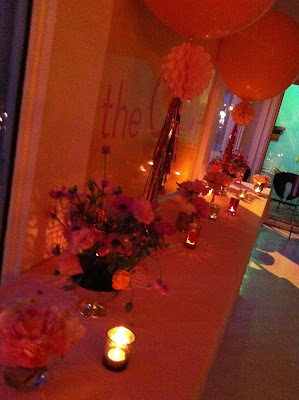 We used as many candles as possible along with Moroccan lanterns which gave the whole room a really warm inviting glow. I found it difficult to capture just how gorgeous and sumptuous it all was but I think you will get the idea. 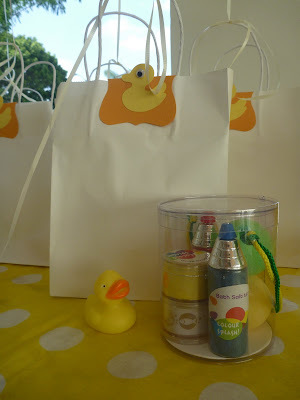 We did an adorable first birthday party this weekend that had a "bathtime" theme for the most darling little one year old. 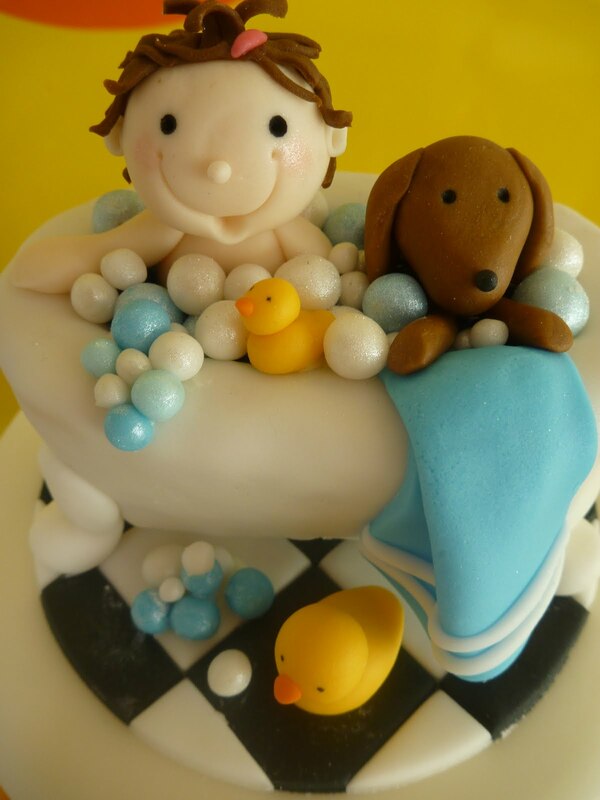 When we heard bathtime and ONE year old -- we immediately thought "Rubber Duckie, you're the ONE!!" 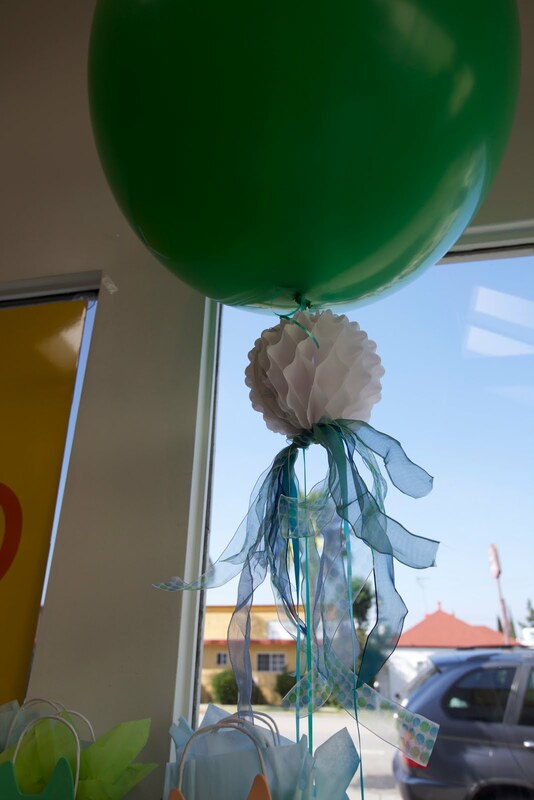 So that was our jumping off point for the decor and gifts. We did our yellow dots (bubbles) table cloth on the back table -- and our yellow swirlie (kind of wave like) runner on the main table. 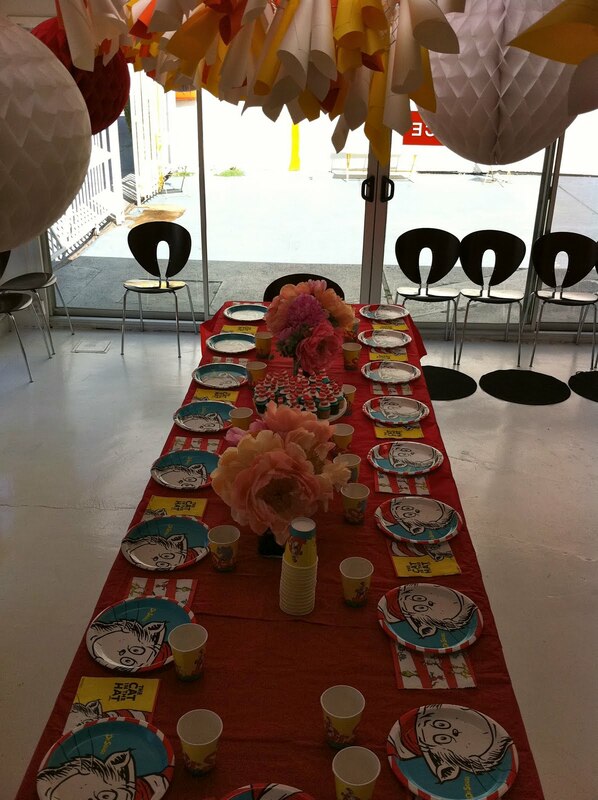 We scattered our felt dots as well as round mirrors on the main table -- which looked like bubbles... and filled several round vases with our "bubbles" -- clear plastic and Styrofoam balls in varying sizes -- and rubber duckies. 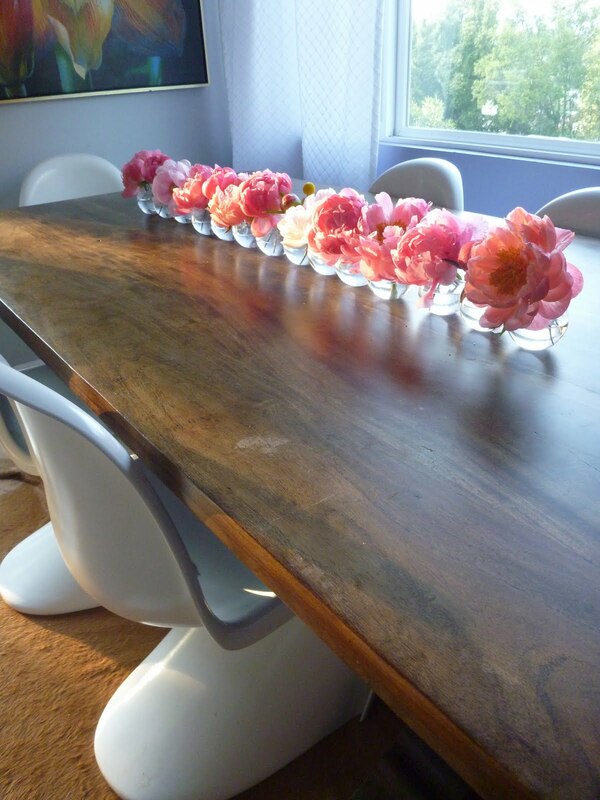 We did one larger vase in the center of the table as well. Lucinda had done some gorgeous pink and orange flowers that we used (just the pink peonies on the table here) that also made it extra special. 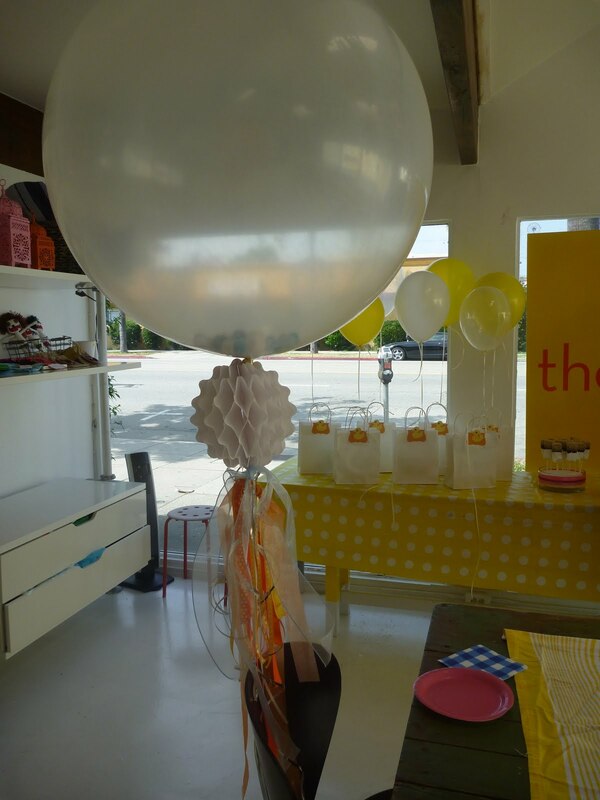 We were going straight up orange, yellow and white, when in walked Julie with her fabulous treats -- and she told me the mom told her that she wanted elements of pink and blue as well. Always happy to roll with whatever is throw our way -- we did a last minute switch to pink plates and blue gingham napkins. I am so pleased with how that curve ball spiced up the entire look! I also did a BIRTHDAY BALLOON... a huge clear "bubble" that I filled (I should've filled it more -- but we are still working out the kinks on the big balloons... and it seemed QUITE full when it was deflated!) with blue and white sparklie fuzzy balls... which was a really cool effect. Each of our little guests took home a darling goodie bag filled with a rubber duckie, a duck noise maker, and a fabulous assortment of bath time salts and scrubs and sudsie bath markers and such. This was such a cute - but not cutesy in any - way to celebrate a first birthday -- and we just loved how it turned out! Oh my! 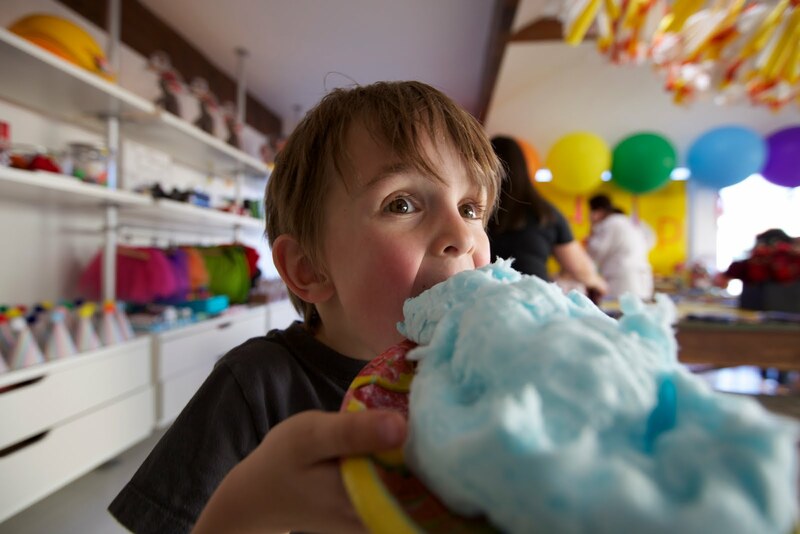 Lucinda and I did --if I do say so myself - the most AMAAAAZING party for our kids. And I am embarrassed to say it was all the way back in APRIL! We have been so busy with all the parties here at the COOP that we haven't had a moment to get together our pics from our OWN party to share! Naughty naughty girls! 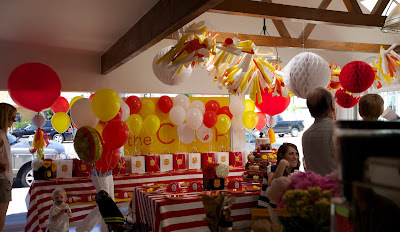 I am just putting this up as a teaser -- and to light a fire under our rear ends so we get a full post together that shows all the fabulous-ness that was our WIZARD of OZ celebration for our little munchkins!!! More pics... coming SOON! This is two different parties -- a variation of the same theme, really! We did these cute Spring Fling/ Summer Garden parties -- one with just ladybugs for the little ladies -- one with ladybugs and bumble bees! The girls got the wings, a tutu in complimentary color and an antennae headband. So darling. The boys got to be the bug catchers.... safari hats and bug nets, and cool little screened bug houses. Both of the parties were beautiful -- with fresh flowers and grass runners. And Julie's cupcakes -- again and of course! Feelin' ready for summer yet? I first discovered JADEtribe about two years ago when I was on the hunt for a summer vacation gift for Juliet. 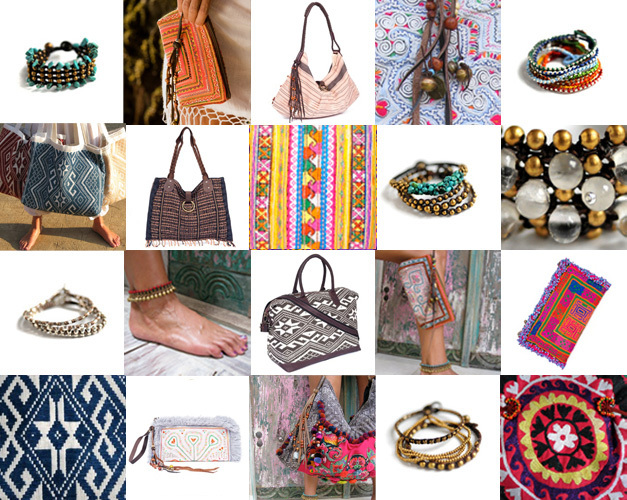 I succeeded in my mission to buy Juliet something super chic and beach fabulous when I happened upon the small JADEtribe purse with leather wrist strap. Juliet loved it and so began our joint romance with this incredible brand. Once we met the founder Kimberly Hartman we knew it was true-love. Kimberly has managed to combine 100% natural fabrics with ethical work practice. 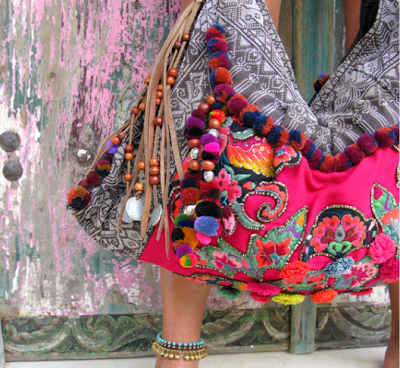 Kimberly hires the women of the rural town of Laos to create and sew the textiles giving us beach(y), bohemian cool bags & purses. The COOP has placed a big order which arrives next week - but you better hurry before Juliet and I scoop up the lot! It seems that everyday I have several people adults and kids alike remark on how wonderful this Sunflower display is, so I had to share. 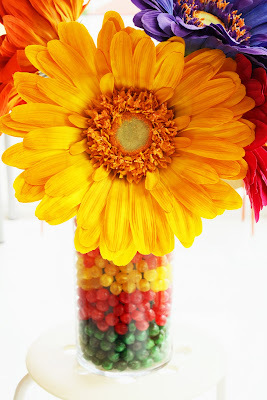 I created this candy laden vase for my sons birthday party. I discovered the festive colored sunflowers at a party store in Las Vegas - (Yes even when I am on vacation I will hunt out the local party store!). Although Juliet and I prefer NEVER to have anything fake at the COOP, especially flowers I just couldn't resist these. I then filled the vase with florist foam so as not to have to use too many candies, then spent several hours sorting the hard boiled candies into colors then just filled the vase and presto - a fun, cool easy display that keeps everybody guessing. We recently had the pleasure of working with a super fabulous mom on a Yellow Submarine party for her Beatle loving son Nicholas. 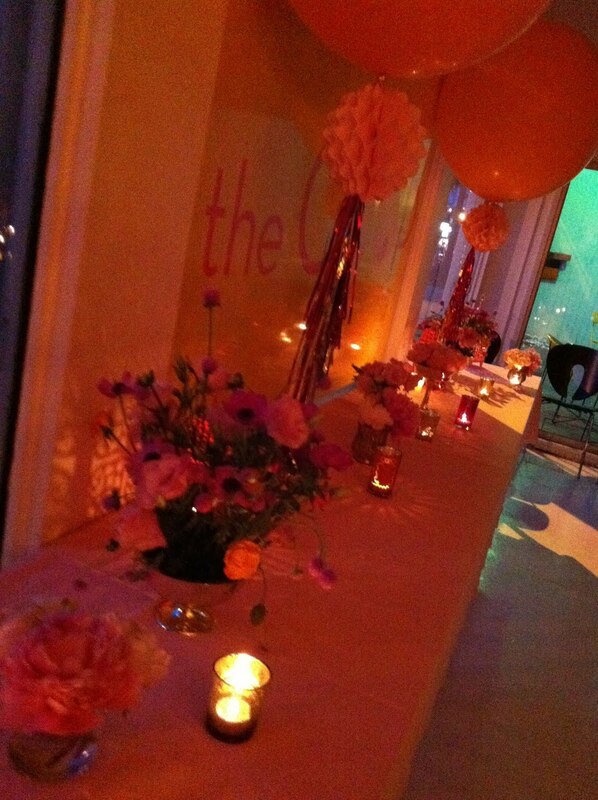 It was a truly gorgeous party and so happy and bright. The mom added some cool Yellow Submarine elements and the stunning flowers made everything pop. 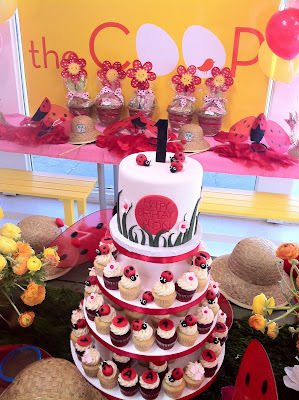 The incredible cake (pictured) was supplied by the uber talented Julie of blue-cupcakes along with a whole dessert bar. At cake time all the little ones looked so adorable in the John Lennon sunglasses and yellow boas that made up part of their party favor. 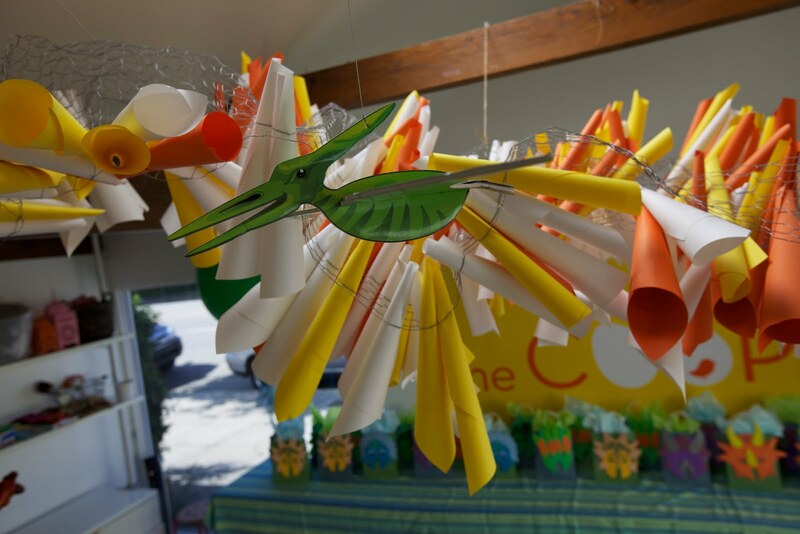 This party theme guarantees happy, smiley people enjoying life in their Yellow Submarine! It's Peony season! And - I for one -- could not be happier! 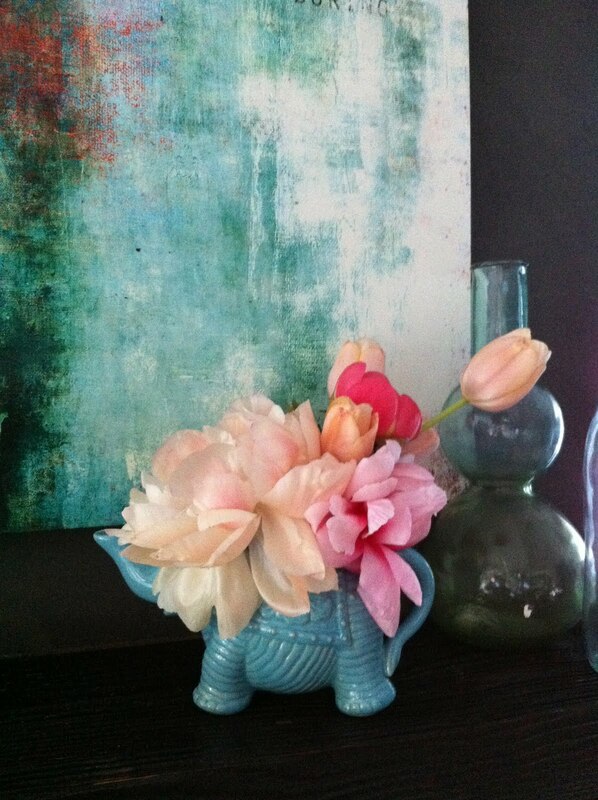 I ADORE peonies... got 'em at the COOP, on my mantel (in my elephant teapot! ), on my dining room table, in my kitchen.... I have them everywhere! 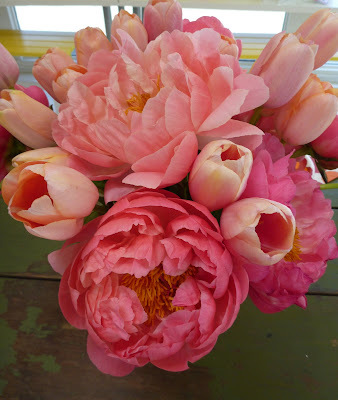 Just had to share some pics of the peonies all around brightening my days this week!!! 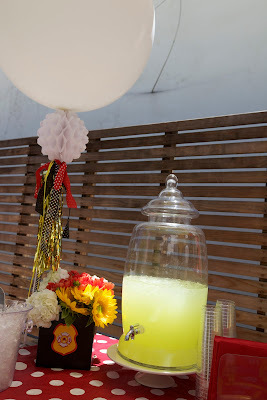 The Midsummer Nights Dreamy Party is one of our most popular here at the COOP. 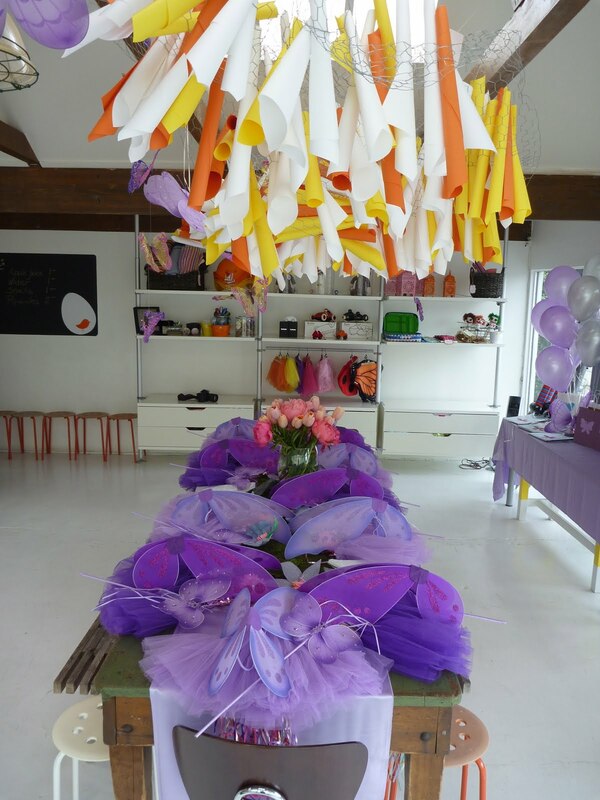 It is generally done for birthday girls -- because the fairy wings and tutus and wands and halos are so gorgeous -- what little girl can resist? But the boy gift for this party is also simply adorable -- the Knight costume (complete with a faux chain mail helmet ) is just darling. 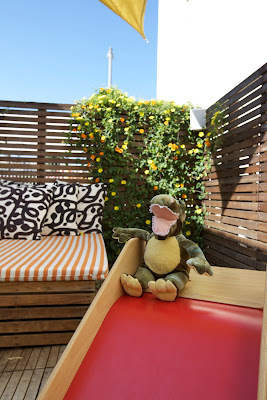 And the boys ADORE the inflatable (slightly less hectic!) swords! 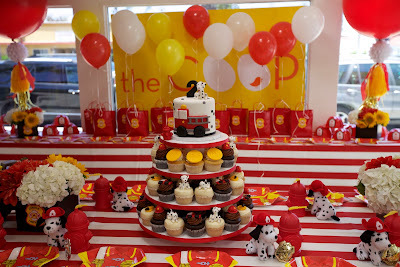 It's a pretty party, for sure -- but the boys are NOT forgotten! This particular party - in fact -- was for a brother and sister. We generally do this party in pinks and purples and whites -- or oranges, reds and yellows -- but this mom wanted purple only. Which I think looked lovely. I got to use the sparklie paper flowers that I made a while ago, sprinkled on the grass table runners with some real peonies as the showstopping center of the table. Hung a few purple butterflies -- and the rest was history. 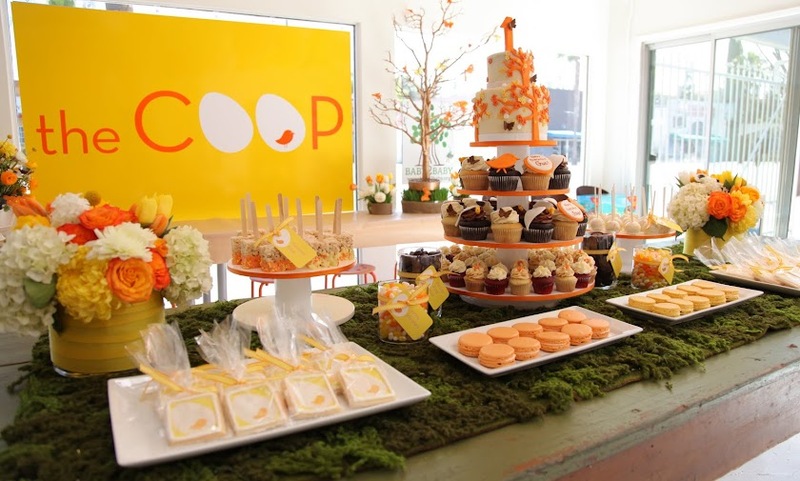 Another gorgeous celebration at the COOP!